"This book is dedicated to my two children, Christina and Mark; and to my husband Brian, with all my love." "Beside its being a history of my family in India, another reason for writing this book is that in this, the 21st century, the Anglo-Indian community will have been absorbed through marriage into the other cultures to which they emigrated and our little ethnic group will soon disappear from this world in peoples' consciousness and in actuality." 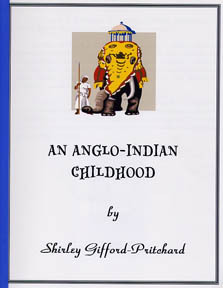 There need be no further justification for "An Anglo-Indian Childhood" except to say that it is also an immensely enjoyable read. As the title implies it is a tale of growing up in India in the last days of the Raj, up to the early 1950s, when the Giffords, like so many other Anglo-Indian families set sail for "Blighty". However, what makes Shirley's book different from so many other biographies covering the same period, is that she knows how to tell a good story. She is perceptive, humorous and nostalgic by turns. She sums up in a few paragraphs what it meant to be an Anglo-Indian during those years preceding Independence, and then goes on to sketch her family history, with commendable brevity and focus. All of us will recognize with delight the familiar landscape of Anglo-India, not only in terms of the towns we grew up in, but also the minutiae of our day-to-day lives, the servants who became part of our families, the houses we lived in, and the schools we attended. Her anecdotes are enlivened by excellently reproduced black and white photographs of friends, family, pets and familiar landmarksmany of which faces and places might well be recognizable to folks who have lived in Ajmer and Nagpur. Payment by cheque or Paypal.